Homeownership can be a stressful venture, especially when hearing about the potential for various unseen dangers, such as mold, asbestos and especially radon. With the proper guidance and education, however, consumers can purchase homes with peace of mind, knowing how to properly protect their home against these dangers and how to mitigate an already-existing radon problem. How can REALTORS® play a part? January is National Radon Action Month—initiated by the U.S. Environmental Protection Agency (EPA)—the perfect opportunity to educate clients about radon, as many buyers and sellers, especially first-time homeowners, are not fully informed on the matter. So, start with the basics. Radon is an odorless, colorless and tasteless radioactive gas that naturally gets released when uranium decays, and is found in rock, soil and water. It is the second-leading cause of lung cancer after smoking. There are an estimated 21,000 radon-related deaths each year in the U.S. Typically, homeowners will have the highest levels of radon in the basement and lower levels of their home, as the gas permeates through cracks in the foundation, coming up from the soil beneath the home. The best time to test for radon is during the winter and summer months, when heating or cooling systems are running. The home needs to be closed up for around 12 hours before the test begins and throughout the remainder of the test to ensure radon is effectively mitigated. Radon is measured in picoCuries per liter of air (or pCi/L), and the EPA recommends that homes with levels at or above 4 pCI/L be mitigated, which can cost between $1,200 and $1,500. Some states offer free radon test kits at partnering local health departments/districts. There are no existing treatments that remove radon from the body once breathed in. In November 2015, the EPA initiated a collaborative project between the American Lung Association and three federal departments and agencies and nine national organizations, The National Radon Action Plan; A Strategy for Saving Lives. The initiative looks to eradicate preventable radon-induced lung cancer in the U.S. The project hopes to reduce radon risk in 5 million homes to prevent 3,200 lung cancer deaths by 2020. "EPA is very pleased to be a partner in this important life-saving effort to prevent lung cancer caused by radon. Working together creates new opportunities for reducing the risk from radon. Combining our resources will save American lives by magnifying our effectiveness in preventing exposure to radon in homes and schools," said former EPA Administrator Gina McCarthy in a statement at the time. In addition, the Federal Action Plan for Saving Lives, implemented in 2011, works with federal policy to reduce risk from radon exposure in the estimated one half-million homes, schools and daycare facilities that may have high radon levels. Agents should guide their clients through real estate transactions ensuring consumers are knowledgeable of the health risks posed by high levels of radon. For those looking to purchase an existing home, encourage clients to have the property inspected by a qualified radon professional to determine whether there are unsafe levels of radon present, and inform them of processes for preventing future radon challenges, such as implementing radon-resistant construction. For consumers looking to buy new construction, make clients aware of the options available for preventing dangerous levels of radon and the steps to take if levels are high in the future. Several builders use radon-resistant construction techniques in new homes. 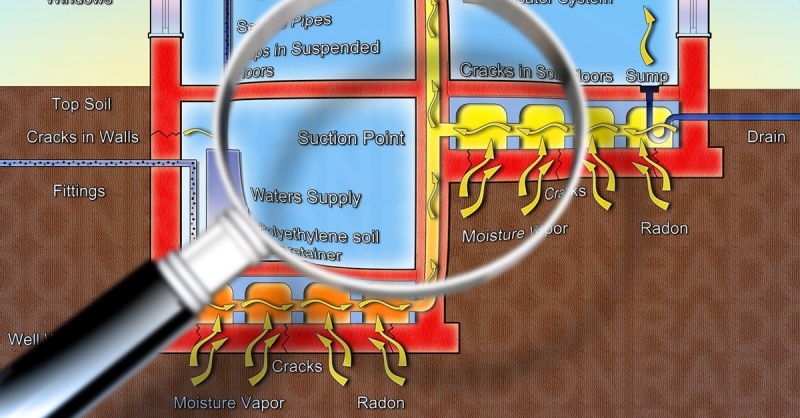 These methods are designed to reduce the amount of soil gas that enters living spaces and simplify radon removal if these prevention techniques fail after construction has finished. The EPA provides a database of industry contacts, broken down by state, who utilize these methods. In many cases, the cost to include radon-resistant features during construction is less than the cost to mitigate the home after it has been built. 1. A 4-inch layer of coarse gravel below the foundation slab allows radon and other soil gases to move freely underneath the home, promoting circulation instead of gas buildup that can enter the home and become a health hazard. 2. Placing a heavy duty, 6 mil. polyethylene sheet or vapor retarder over the gravel will further prevent the gases from entering the home. 3. Incorporating a vent pipe that runs from the gravel layer through the home's conditioned space and to the roof will help the gases escape to the outside of the home, rather than collect inside. 4. Sealing and caulking any cracks and openings in concrete foundation floors and walls will help keep the gases from entering the home. 5. Installing an electrical junction box in the attic, to be used with a vent fan, can help circulate the air and let radon gases escape to the outside of the home. Since 1990, over 1.5 million homes have been constructed using radon-resistant features, according to the EPA. For more information, please visit www.epa.gov/radon and provide your clients with the EPA's Home Buyer's and Seller's Guide to Radon.